Yoyo Wallet is an easy-to-use, secure mobile wallet that allows users to make payments with their smartphones. The application utilizes innovative mobile payment technology to combine payments, digital receipt collection, and automated loyalty programs through an easy QR code scan. This is a reliable solution designed to revolutionize the brick and mortar retail experience for retailers and their customers. It has stealthily rolled out features that support not only in-store transactions but also digital customer interaction. Yoyo Wallet also offers rewards that can be promptly delivered based on the customers buying behaviors. The applications selling points are simplicity, fast payments, and the way it transforms tokenization of identity in the retail space. The app works at any retail outlets, and it generates a sense of ubiquity that can be optimized by new businesses to grow revenue. Yoyo Wallet is a robust application designed to introduce technological advancements into the mobile payments space. It’s built with simplicity and fast payments in mind. You connect your cards (debit and credit) or Apple Pay once and start using your smartphone to make payments. It allows you to keep all your financial detail in centralized place, gain no additional wallet weight, and take only your smartphone in the shopping experiences. The solution is ultra-secure; your financial details are stored under lock and key by a trusted payment service provider and not in your smartphone or by Yoyo. The application also utilizes Stripe (payment service provider), who relays tokens of your payments details, every time you make a payment. It utilizes a double tokenized system; Yoyo sends a token different to the one provided by Stripe thus making paying ultra-secure. By tokenizing consumers’ identity, it means the retailer will never know your true name or email address, which is increasingly important. Yoyo Wallet utilizes a system that manifests as two distinct products; a retailer app, and another for the consumer. On the retailer’s end is an app designed to helps retailers to understand their customers and build better relationships. It delivers key insights that make it easy to automate marketing using tools like gamified campaigns. Retailers can easily interact with customers at the POS and connect them to SKU data, thus transforming anonymous shoppers into consumers with defined purchasing habits and preferences. On the other end is a consumer app designed to enable consumers to collect loyalty, make payments, receive rewards & personalized offers, and get digital receipts via a simple scan of QR code. 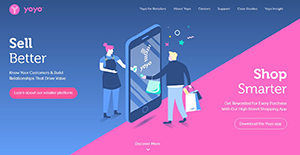 If you are interested in Yoyo Wallet it might also be sensible to check out other subcategories of Best Mobile Payment Systems collected in our base of SaaS software reviews. There are popular and widely used solutions in each software group. But are they automatically the best fit for your company’s unique needs? A popular software application may have thousands of customers, but does it provide what you need? For this reason, do not blindly shell out for popular systems. Read at least a few Yoyo Wallet reviews and consider the factors that you wish to have in the software such as the fees, main tools, available integrations etc. Then, choose a few apps that fit your wants. Check out the free trials of these apps, read online opinions, get clarifications from the maker, and do your research meticulously. This profound research is certain to assist you select the finest software application for your firm’s unique wants. How Much Does Yoyo Wallet Cost? We realize that when you make a decision to buy Mobile Payment Systems it’s important not only to see how experts evaluate it in their reviews, but also to find out if the real people and companies that buy it are actually satisfied with the product. That’s why we’ve created our behavior-based Customer Satisfaction Algorithm™ that gathers customer reviews, comments and Yoyo Wallet reviews across a wide range of social media sites. The data is then presented in an easy to digest form showing how many people had positive and negative experience with Yoyo Wallet. With that information at hand you should be equipped to make an informed buying decision that you won’t regret. What are Yoyo Wallet pricing details? What integrations are available for Yoyo Wallet?